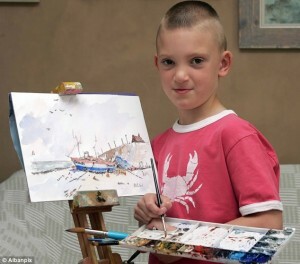 Schoolboy Kieron Williamson, who was nicknamed as ‘Mint Monet’, has been painting ever since he was 5 when others of his age still struggle to draw a fine straight line or maintain their crayons within the limited lines of drawing books. According to the Daily Mail’s report, he has become the most world’s renowned youngest successful artist by selling 24 paintings in about 15 minutes for $386,000. Williamson is from Holt, Norfolk of England. His passion for paintings was prominent by the age of six and his knowledge of advanced shading and perspective in his painting caused huge attention of the UK media. In July 2010, Williamson exhibited his work in Holt. This time he achieved another landmark by selling all his painting within 30 minutes for £150,000. In 2011 November, in yet another exhibition, his 33 paintings were sold again within 10 minutes with a total value of £100,000. In the same exhibition, his most beautiful painting Istanbuls’ Suleymaniye Mosque was alone sold for £15,595. Kieron Williamson discovered his passion for painting on a family holiday in Devon and Cornwall. He asked his parents to give him paper to draw a boat and very soon he developed his own matured sense for colors and shadings. His talent for English countryside, seascapes and pastoral scenes makes him distinctive and as original as the “young Picasso”. His mother Michelle Williamson has recently written his biography “Kieron Williamson Coming to Light — The Remarkable Story of a Child’s Gift to Painting,” which portrays the incredible story of his passion and gift for painting with more than 120 wonderful images of his art work.